Summer usually equates to swimming in the azure waters in the beach, refreshing oneself in a cool swimming pool, playing inside fun-filled water parks, or cruising around idyllic islands. But beaches are definitely not the only bodies of water that one can immerse in to find relief from the punishing summer heat. 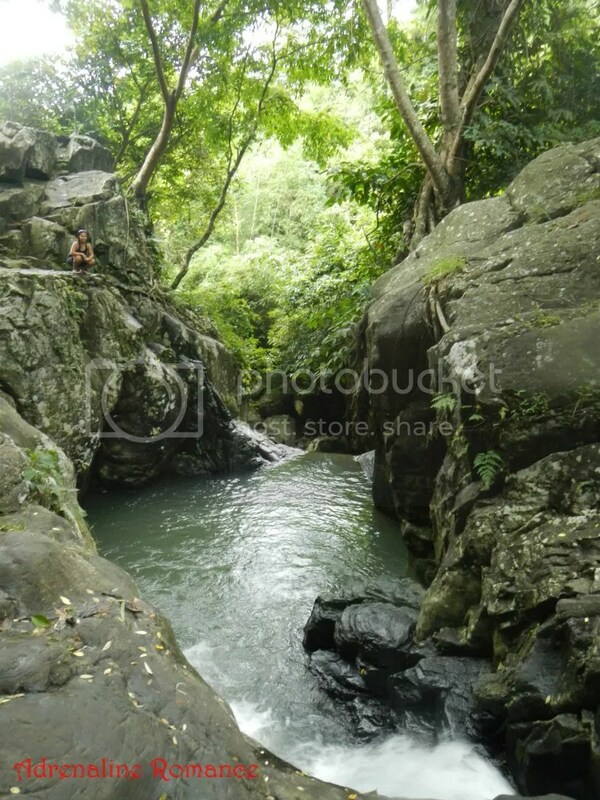 Adventurers, hikers, and mountaineers often penetrate deep jungles, brave treacherous canyons, or climb mountains to dip into pristine, cold, fresh, and natural pools fed by walls and cascades of water. Whether it’s trickling or roaring, a waterfall simply refreshes the mind, body, and spirit. In simple geological terms, a waterfall is an area in the course of a river or stream where water flows over a vertical drop. In many rivers, there may be a number of drops. 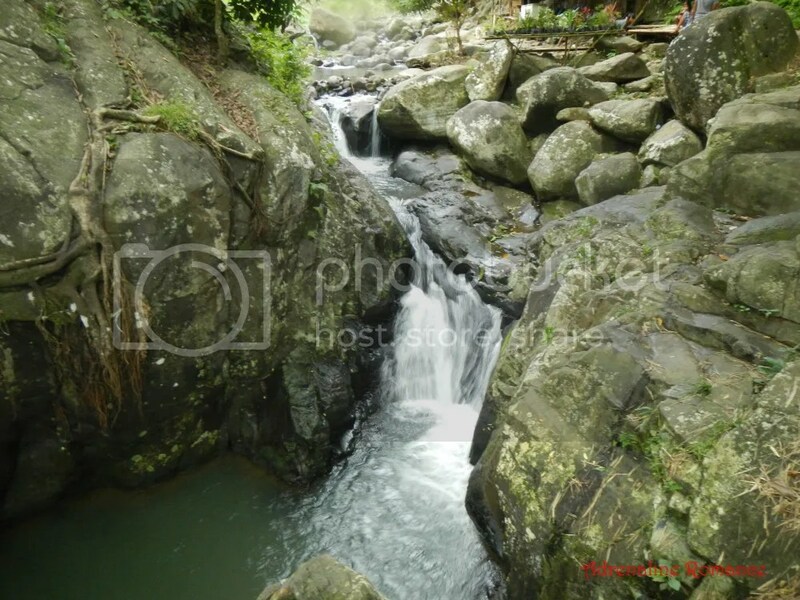 The river that flows through Mambukal Resort is an example of such series of waterfalls. 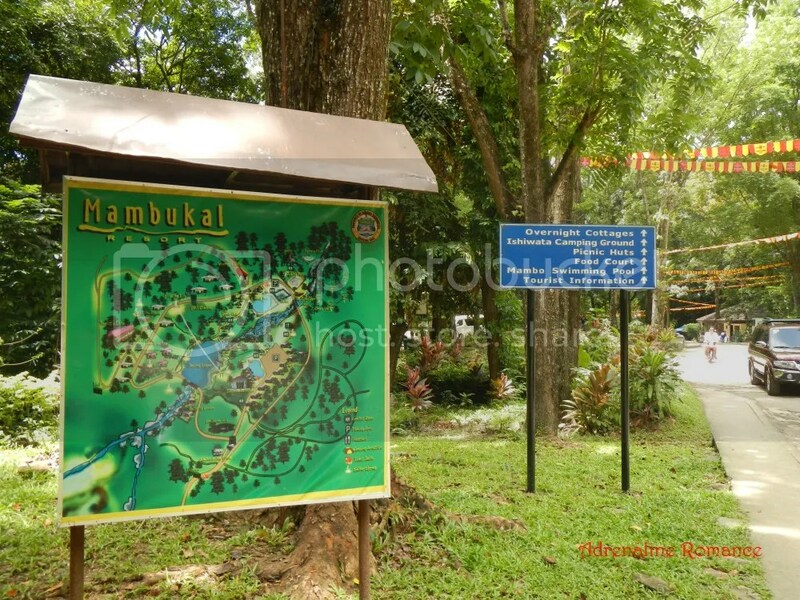 Wait, how did we get to Mambukal in the first place? Well, Sweetie, a few friends, and I were supposed to climb the mighty Mt. Kanlaon, but a day before the climb, our guide sent us an SMS to cancel the climb due to bad weather in Canlaon City. As much as we would like to continue our climb come hell or high water, our safety and the enjoyment of the climb is paramount. Thus, everyone decided to reschedule the Mt. Kanlaon climb. However, Sweetie and I had already booked and purchased a homeward bound plane ticket (i.e. Bacolod to Cebu) a few months ago. Thinking that it would be a waste of money if we don’t somehow make it to Bacolod, we decided to go to Mambukal, which is our exit point for our climb, during the weekend. What was supposed to be a disappointing climb turned out to be a cool adventure. 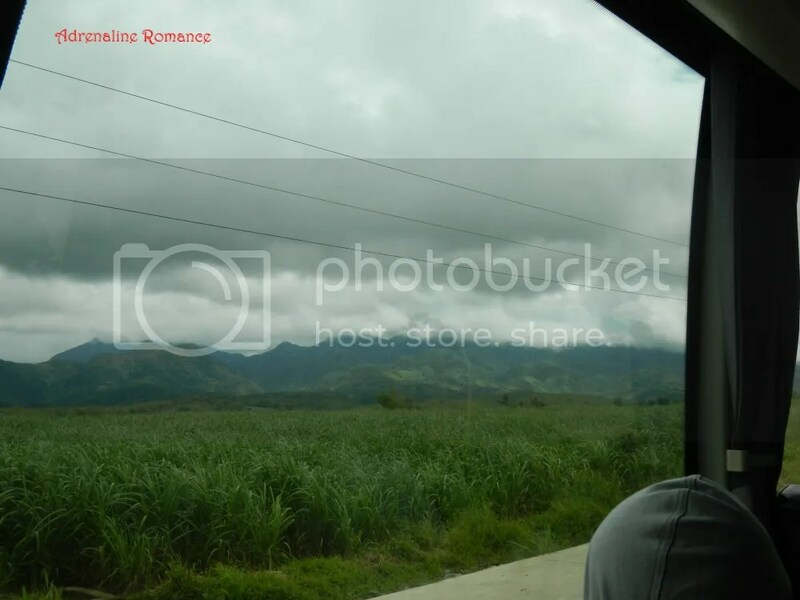 As we rode a bus to Bacolod via Don Salvador, we saw thick gray clouds covering the tops of Mt. Kanlaon and Mt. Mandalagan. Although the weather was fair in the lowlands, based on previous climbing experiences, the microclimate up in the mountains tells a different story. Most probably, the summits will have zero visibility and there will be heavy rainfall. After 7 hours of land trip from Toledo City, Cebu, we finally reached the entrance of verdant Mambukal Resort in Murcia, Negros Occidental. The water that cascaded down from the artificial fountain set the mood for this adventure. 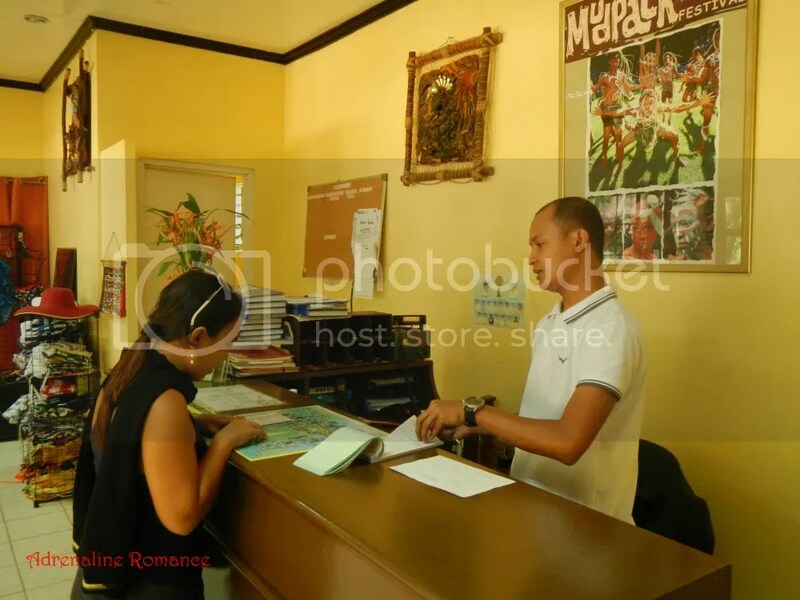 Checking in was a breeze thanks to Mambukal’s helpful and efficient staff. The rooms, activities, and services were reasonably priced. Clear, easy-to-read signs enabled us to find our way anywhere in Mambukal. Maps and signs also point out the attractions in the mountain resort. After checking in, we made our way to our room, which was on the other side of the resort. 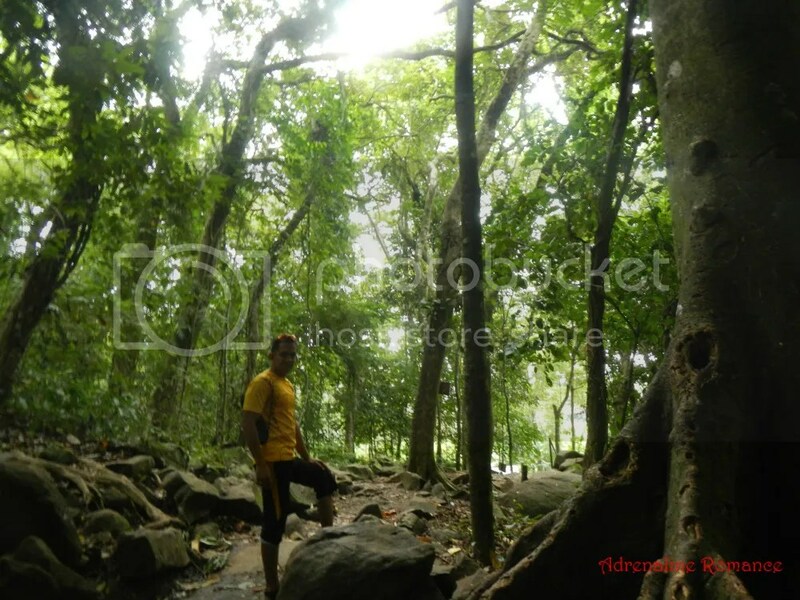 Going from one end to another entailed a 15-minute hike under verdant, broad-canopied trees. 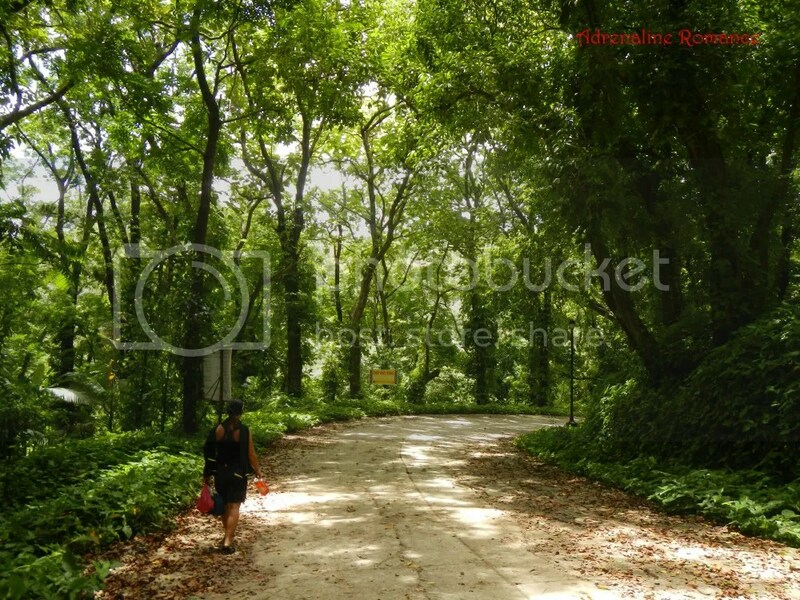 Wherever we went around the 23.6-hectare resort, we saw trees, streams, hills, rocks, and other natural features seamlessly providing beautiful backdrops around artificial swimming pools, traditionally styled bungalows, concrete roads, and other man-made facilities. After resting for awhile and leaving our things in our room, we headed out to the resort’s canteen to eat lunch. It seems that Mambukal resort does not have an in-house restaurant; instead, it leases space to interested consignees. 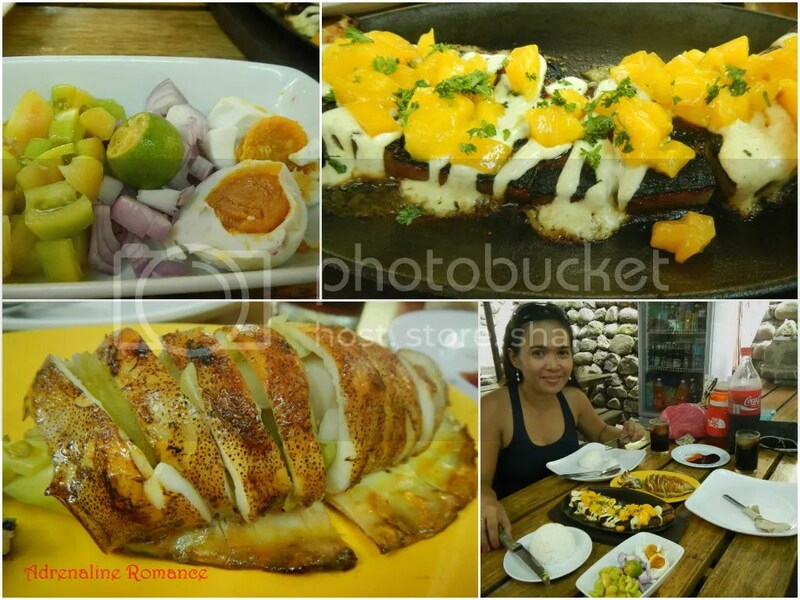 We had a filling lunch of salted eggs, sizzling squid, and sizzling pork belly. The food that we ordered was just the ordinary food that you can eat anywhere, but the sizzling pork belly was surprisingly delectable! It was a perfect example of counterpoint, which Filipino dishes are well-known for. The sweetness of mango counteracted the savory taste of pork belly and the creaminess of mayo, creating a pleasing combination of flavors. 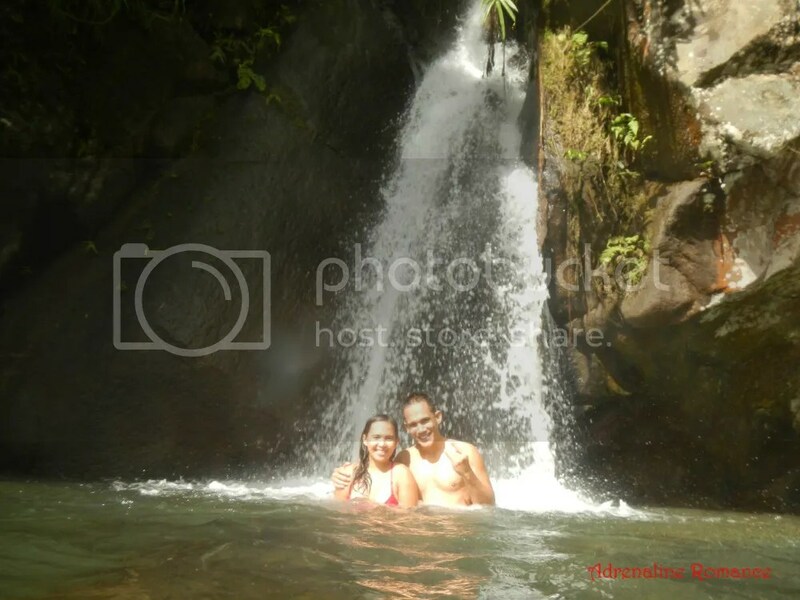 After a hearty lunch, it was time to head out to the much touted Seven Waterfalls of Mambukal. We first headed to the trailhead. No entrance fee was collected, but hikers were required to register their names at the entrance station. Take note of the rules. Sweetie and I may be experienced hikers, but we always give respect to the place we set foot on. Nature is unforgiving and unpredictable, and she deserves great respect. In these areas, complacency can be a killer. 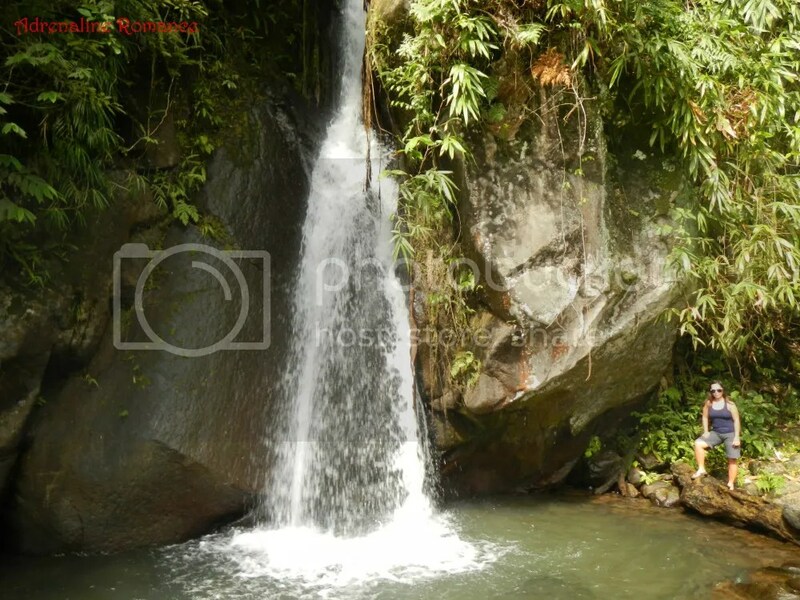 The trail to the Seven Waterfalls is well established and well maintained so that it would be easy and safe for guests to visit the natural wonders. Metal fences act as handholds as well as barriers that prevent hikers from going off the trail. A mountain stream, fed by several tributaries, descends from a series of seven waterfalls, cutting through the middle of the resort. The stream, by which the tributaries are connected to, feeds the water holes, pools, and the boating lagoon in the resort. 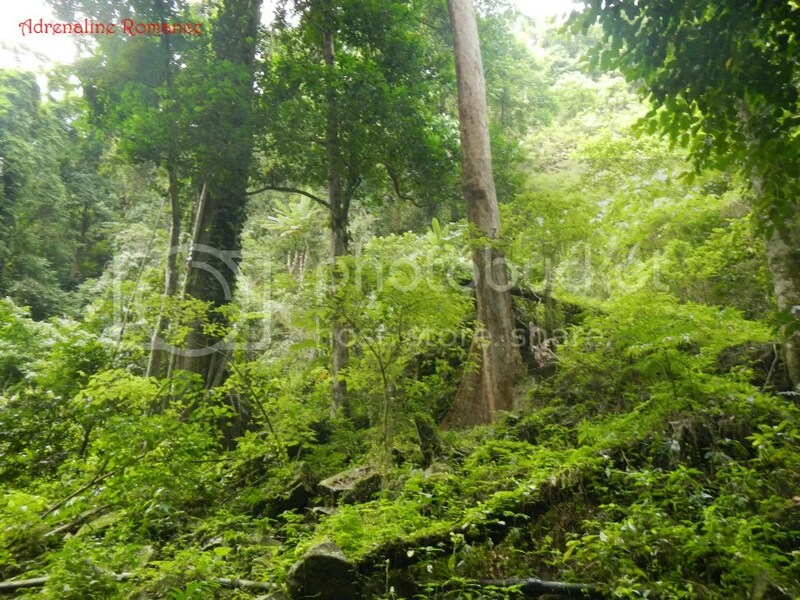 The moss-covered woods around Mambukal are actually part of an ancient ditherocarp forest that extends to the slope of Mt. Kanlaon. Everywhere you look, there are towering, broad-canopied trees that make up the homes of fruit bats and flying foxes. Peek a boo! Some tree roots are large enough to crawl through. Along the trail, we saw hanging bridges above us. 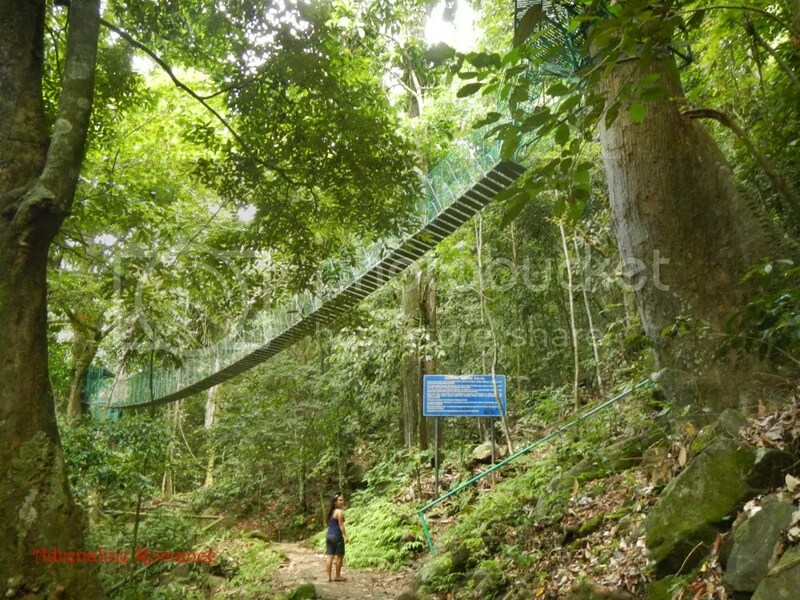 The Canopy Walk involves walking on hanging bridges 25 meters above the ground. The hanging bridges, which have a total length of 153 meters, span across 5 enormous trees. Of course, you don’t have to be afraid; you’ll be issued safety equipment and a guide will ensure that you are safe and secure. Sweetie found a new sport: tree climbing! Hehehe! Actually, the trees had handholds and footholds imbedded in them. 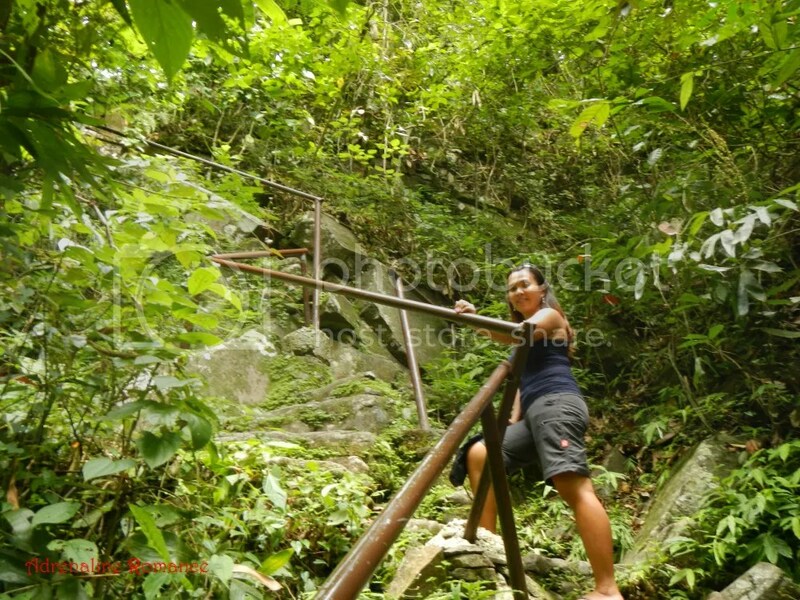 We guess the staff and guides use them to access the hanging bridges. Nearing the first waterfall, we came across this nice bridge. 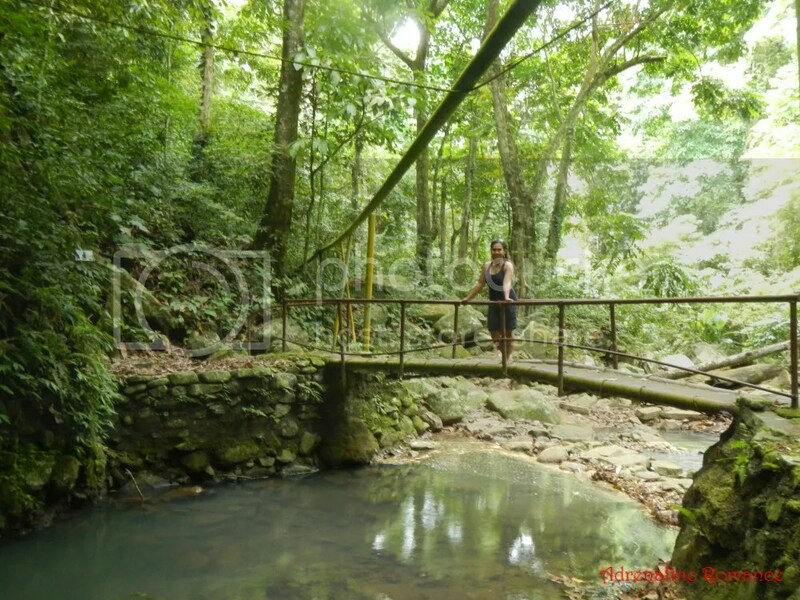 Established bridges and trails make trekking in this area easy and relatively safe. No, that’s not the first waterfall. It’s just a natural drop-off of around 5 feet. But it sure does look nice, doesn’t it? We wouldn’t be surprised if we knew that this place is a favorite venue of photography enthusiasts. The water looked so inviting that we wanted to splash down this part of the river. Big river-born boulders lined up the way to the first waterfall. If it was not for the rail-marked path, guests would have to scramble over the huge boulders. We would certainly welcome such adventure. That’s the first waterfall. It looks magnificent! The water looked so cool and refreshing that we were tempted to dive in. However, swimming from Waterfalls 1 to 3 is prohibited. Don’t worry though; just seeing one of Mother Nature’s many wonders definitely makes us happy. 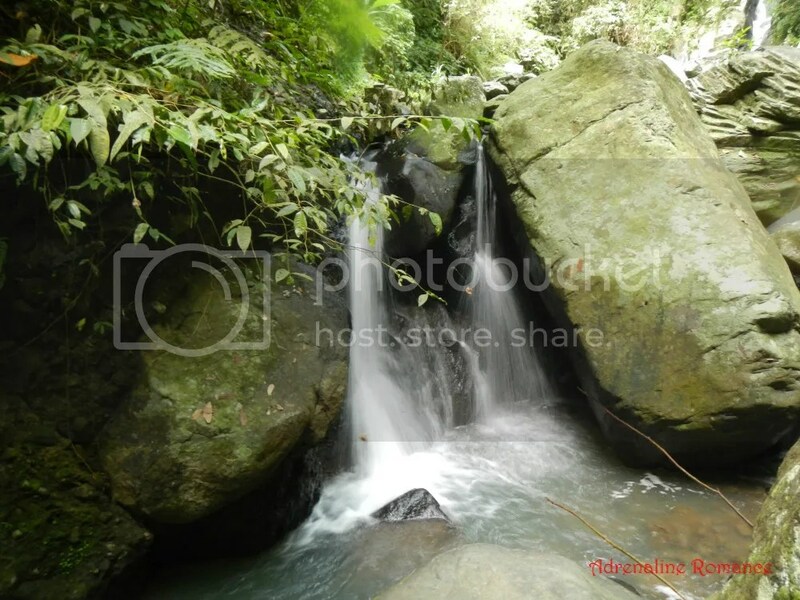 Since the Mambukal Resort is located downstream, the rest of the series of waterfalls are located up the mountain. Moss-covered stairways carved up the verdant slopes make these waterfalls accessible by everyone, hikers and non-hikers alike. Certain parts of the trail, however, are relatively “wild” and hardly bear the evidence of man’s desire to alter Mother Nature to his needs. That’s the second waterfall. Check out that beautiful cascading water. 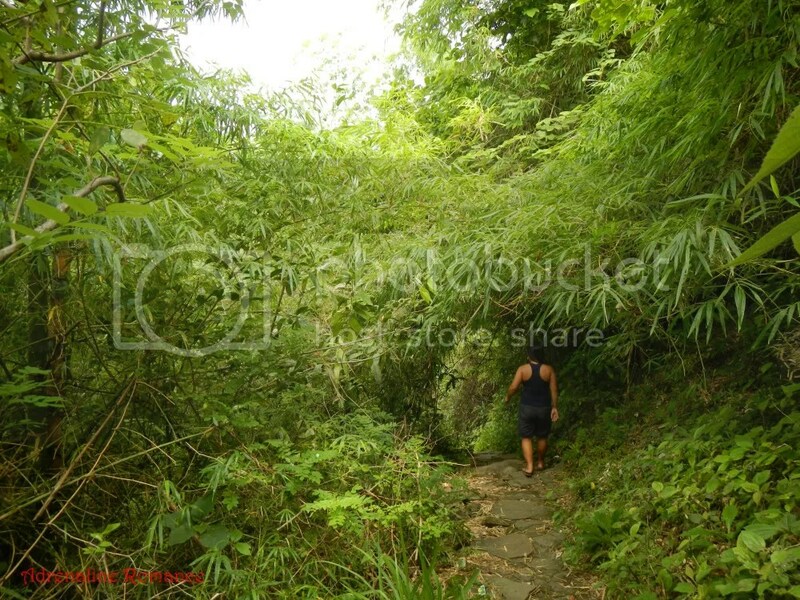 Going to the third waterfall demanded hiking on a long, steep, rocky slope. 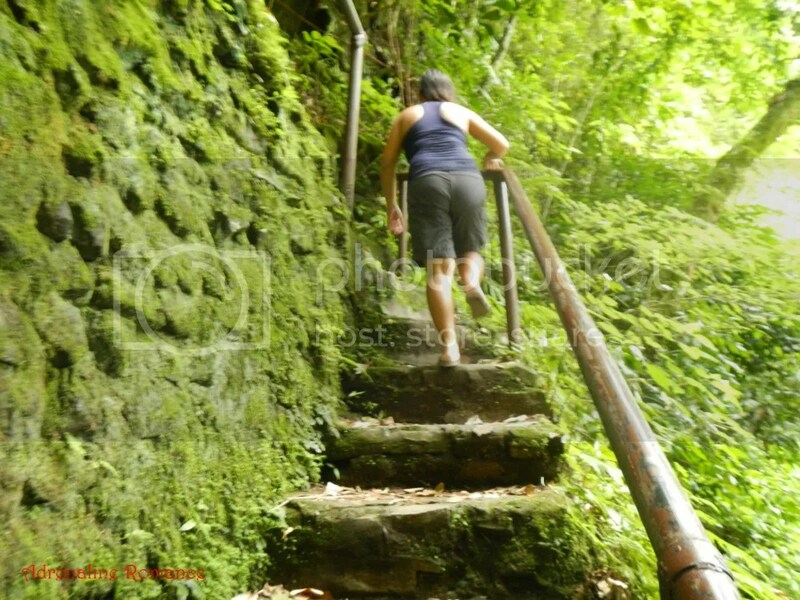 It would be quite a challenge to climb the slope without the rail and the stone steps. The third waterfall wasn’t immediately obvious. We had to get a little bit off the trail to reach a precarious ledge that gave us a beautiful view of the waterfall. We actually felt the power of the river by just looking and listening at the falling water. 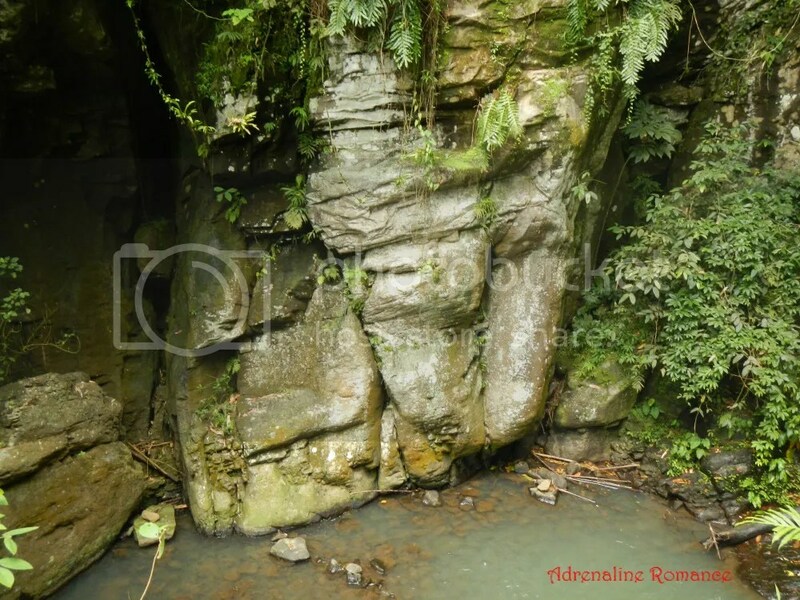 This magnificent rock formation acts as a faithful guardian to the third waterfall. Sturdy granitic or limestone rocks like these make perfect crags for sport climbing. They are solid and strong enough to hold a properly drilled bolt and hanger. 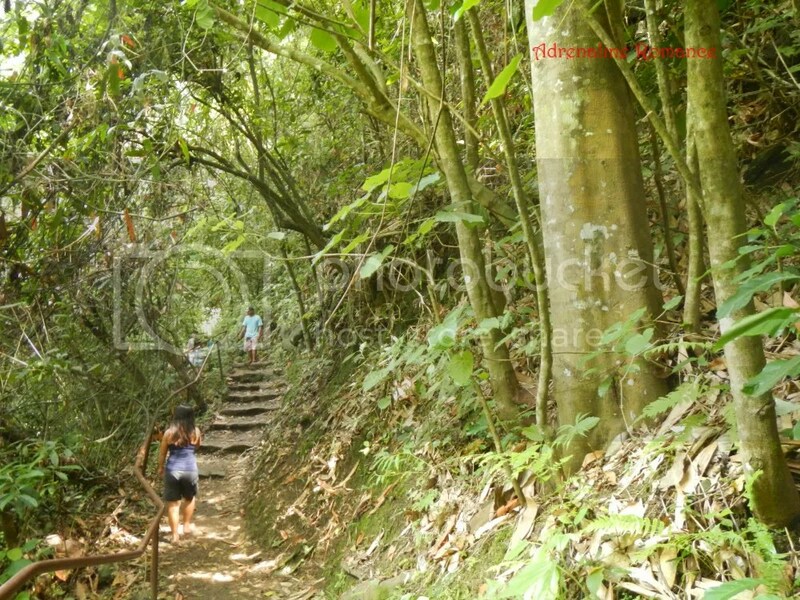 Another steep and slippery uphill climb marked the way to the fourth waterfall. Watch your step because the moss-covered rocks are really slippery. The rest of the way to the fourth waterfall comprised of rolling terrain that was quite easy to traverse. The trail was marked with slabs of stones to make it easy for non-hikers to walk on. Rich, thick, and green foliage provided adequate protection and shade from the afternoon sun. The fourth, fifth, and sixth waterfalls are clumped together. Technically, though, only the fourth waterfall could be considered a “true” waterfall. The rest are just short tiers along the stream. But let’s just respect how the locals termed these tiers. The trail led us up above the fourth waterfall. As you can see, there are locals splashing around here. 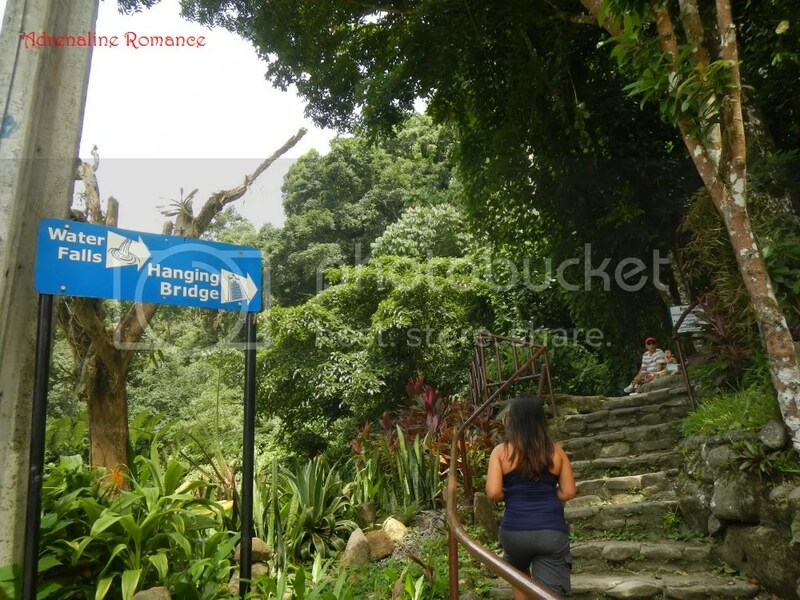 That’s because this area is situated near the fringes of the park where a barangay is located. That’s the fifth “waterfall.” You can take a refreshing dip here and let the force of the falling water massage your back. 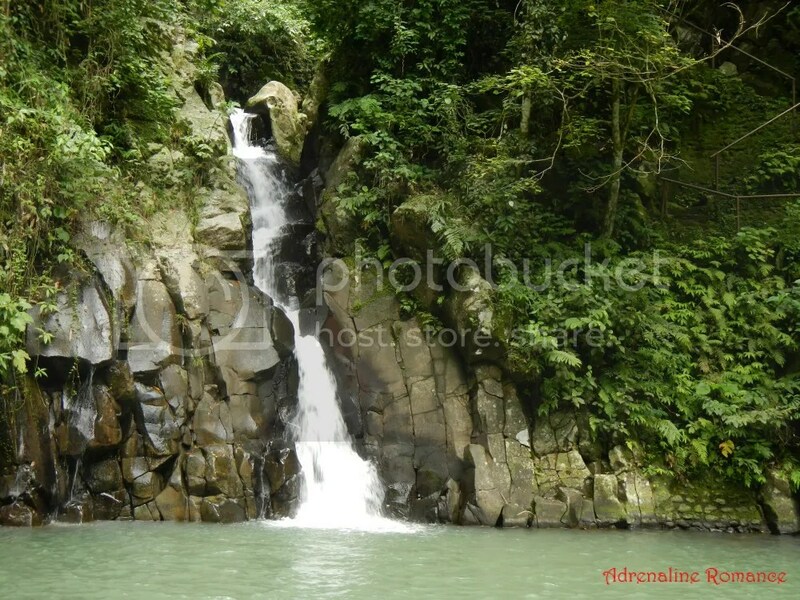 That’s the sixth “waterfall.” Since swimming is not restricted here, you can take a dip under that lovely curtain of water. Here’s a lovely vantage view of the clustered tiers. To provide you a sense of scale, check out Sweetie at the edge of the left wall of the canyon. Local kids use the ledge she’s squatting on as a platform for diving. No, we didn’t dive here . . . even though we were really tempted to follow those brave kids. Hehehe! That’s the small river that feeds the waterfalls and the stream. To get to the seventh waterfall, we had to cross this stream, which means, we had to get our feet wet. 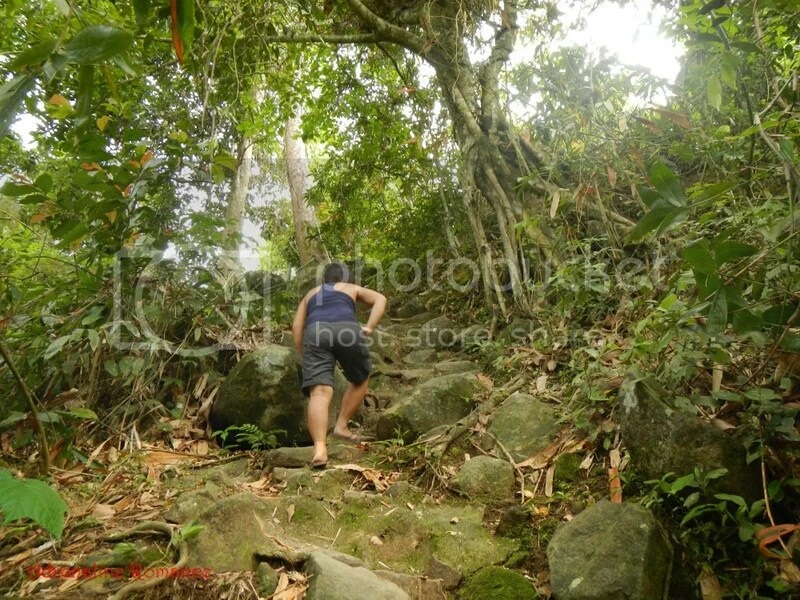 After climbing another slope, we finally reached level ground, which actually looked like an unpaved barangay road. Sari-sari stores, farms, and houses implied that we have reached the border of Mambukal Resort. If you don’t like to hike back to the resort, you may take one of the habal-habals that are parked on the roadside. For a minimum fare, your driver can take you all the way down to the resort. 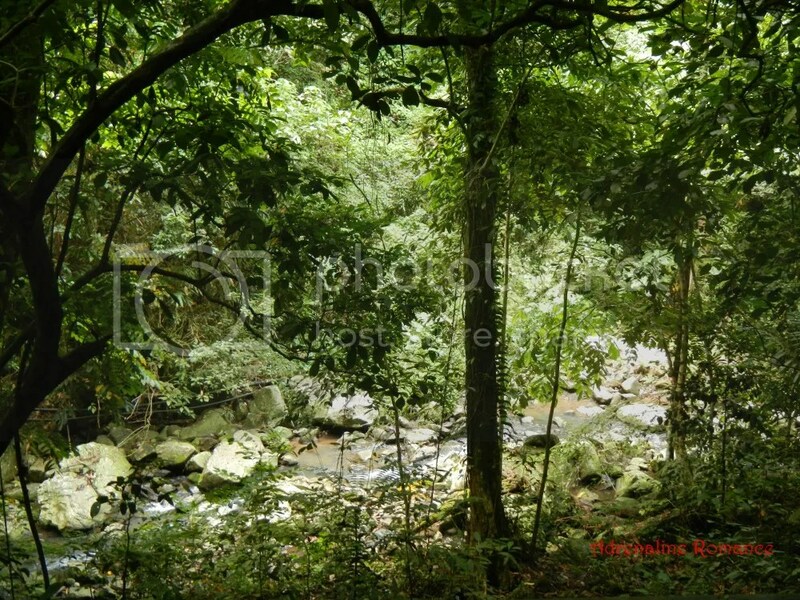 A slightly inclined dirt road led the way to the seventh waterfall. Along the way, local kids offer their services as guides. Actually, the trail is so well-established that you don’t really need a guide; just ask the locals where the seventh waterfall is. However, if you feel generous or if you have a soft heart for kids, then do avail of their service. We also witnessed snippets of simple rural life: men taking care of their farms, women chatting with neighbors while plucking out unprocessed rice grains in large bilaos, and kids playing tag and other children’s games. It is indeed very refreshing to know that amidst the rapidly expanding influence of modernity, such traditions of rural life still remain untouched. When you reach this small, clear stream and hear the sound of rushing water, you would know that the seventh waterfall is close by. 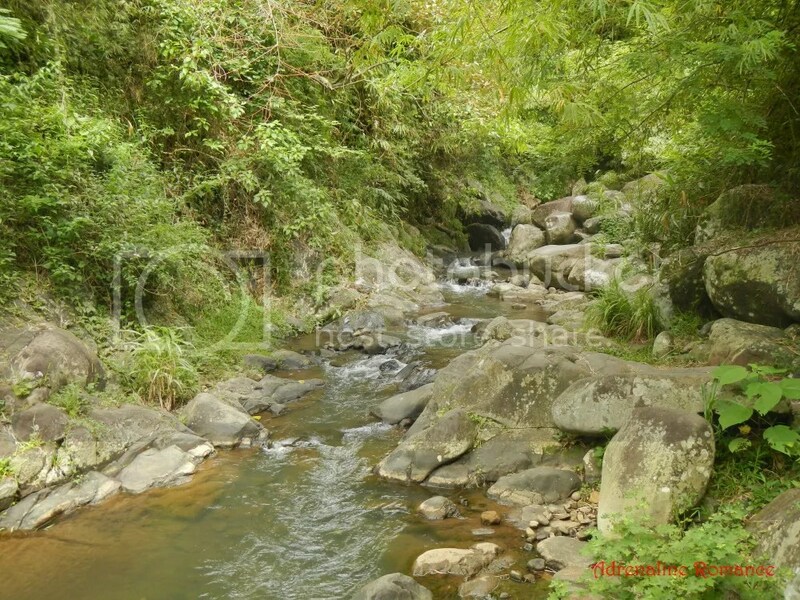 By the time we reached this stream, Sweetie and I had been hiking for an hour. 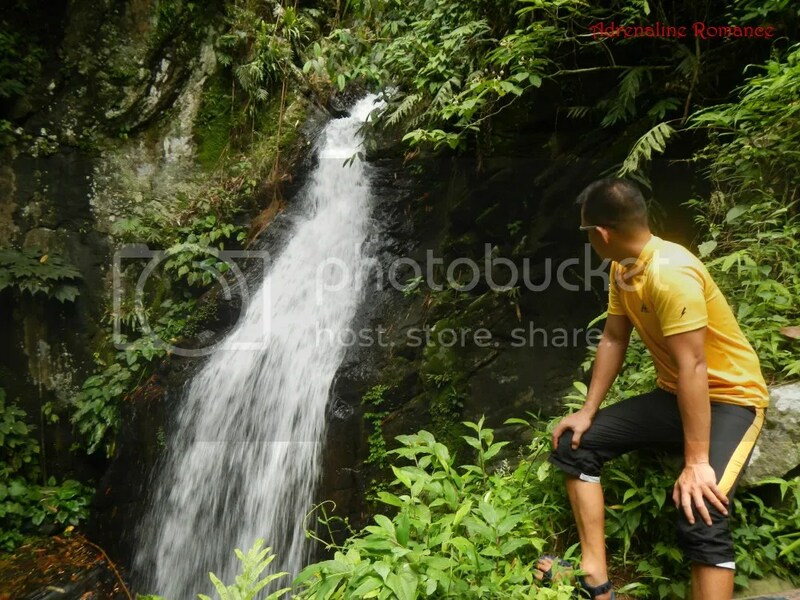 Finally, we reached the seventh waterfall and the supposed source of the water that flows down to Mambukal Resort. Why “supposed?” Well, according to locals, there are around 12 waterfalls that feed the river. However, the last 5 waterfalls are many miles away; visiting these waterfalls would entail several rides. Check out Sweetie at the right side of the photo to give you an idea of the size of this waterfall. One of the nice things about this waterfall is that you don’t have to be a proficient swimmer to explore the pool that the waterfall feeds. The deepest part is just around a little over 5 feet. Of course, the water is so refreshingly cool. 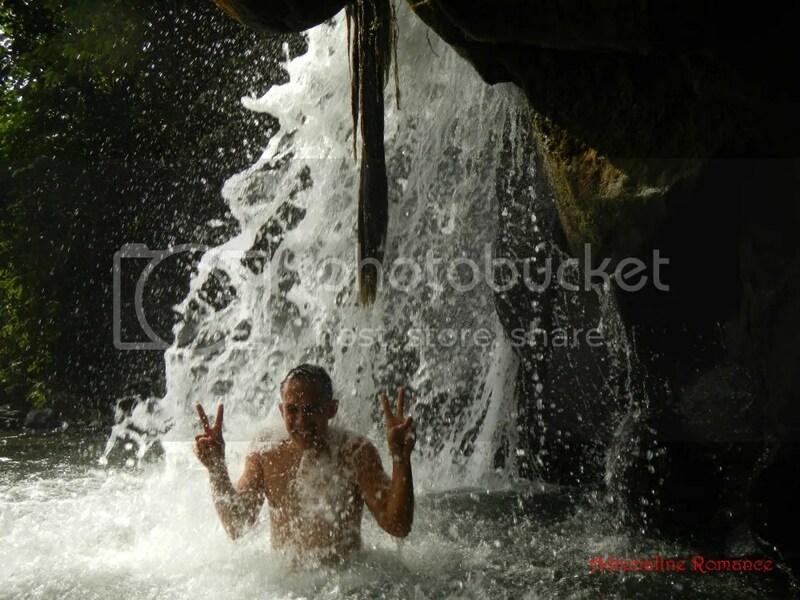 The best thing about the seventh waterfall? Having a free, relaxing, and rejuvenating massage from Mother Nature’s hands. After half an hour or so frolicking in the cool pool, we decided to take the long hike back to the resort since it was getting late in the afternoon and gray nimbus clouds were starting to thicken. 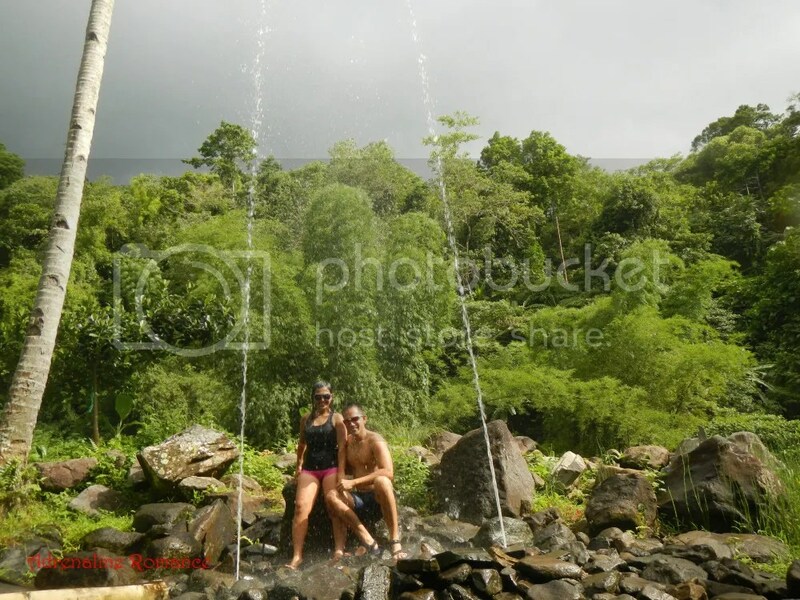 On our way back, we couldn’t resist having a delightful shower in this makeshift fountain. Pressurized water, perhaps for irrigation, shoots right up in the air from two nozzles that act as relief valves. Reminiscing the icon of my alma mater . . . with the bathing trunks, of course. Hehe! 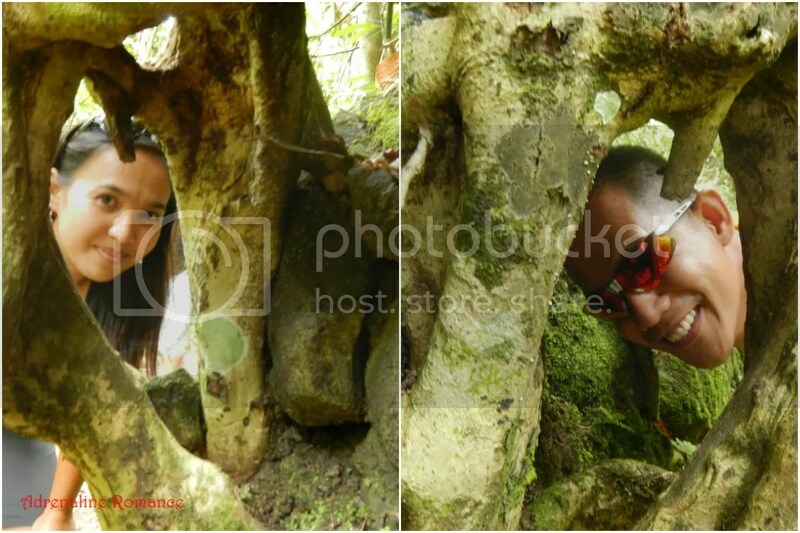 We can describe our first adventure in Mambukal Resort as definitely satisfying. It may not be as extreme as our other treks, but the lovely sights of the seven waterfalls of Mambukal more than compensate for that. Indeed, when you see little-known but massively impressive natural wonders such as these waterfalls, you will realize that Mother Nature is truly the ultimate balm against pain, frustration, desperation, and sadness. 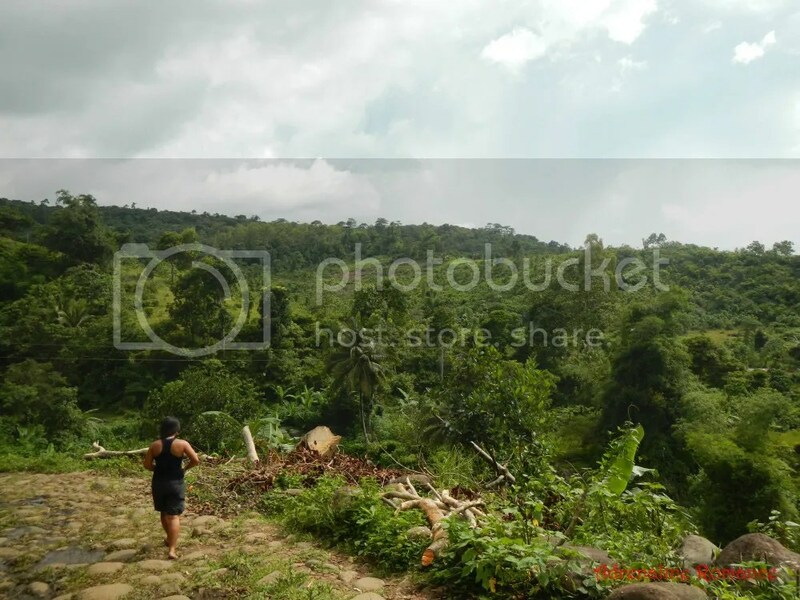 P70 – habal-habal to Mambukal. That’s per head, so it’s P140 in total for that one ride. We have a feeling that we were ripped off. The smoothness and the distance of the ride did not see to justify the P70. It “felt” like P50. Thus, it is strongly recommended you haggle with the fare. If not, ask a barangay official (something which we should have done) for the right fare. In our case, we had a confirmed return flight. This means that we had to get a ride to the airport from Bacolod City. Hiring a taxi generally costs P500 (as taxi drivers demand a fixed price considering the airport is really far from the city), and taking jeepneys to a faraway airport is too much of a hassle. To avoid inconveniences and the possibility of not being able to catch our flight, we went to SM Bacolod and rode a shuttle to the airport. The shuttle is just an air-conditioned van, very similar to a V-hire. Fare per person is P100. * All rates are on a per-person basis. 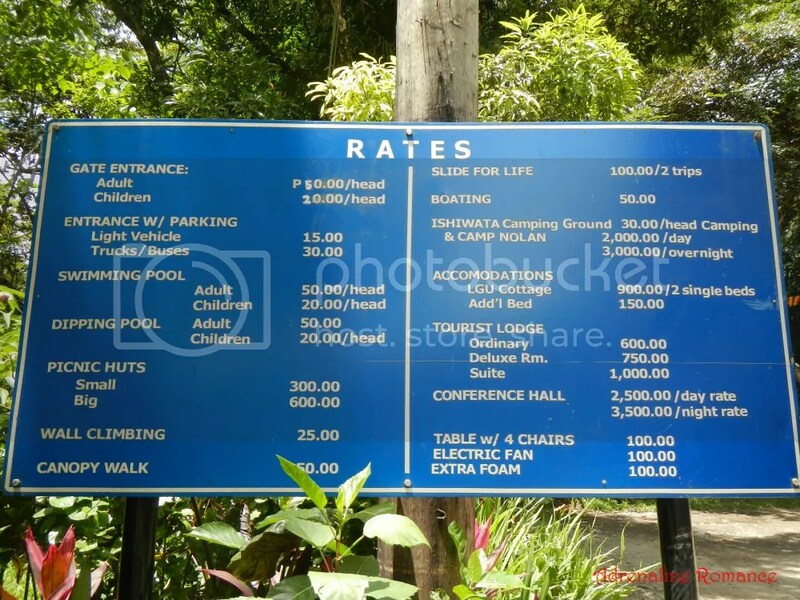 We did not include prices for meals, snacks, souvenirs, tips, and other fees in this rate sheet as you may have different needs, preferences, itineraries, miscellaneous transportation, and sharing scheme from us. We also didn’t include the return-trip airfare, which we got as a promo. Note that all figures are subject to change without prior notice. 1. 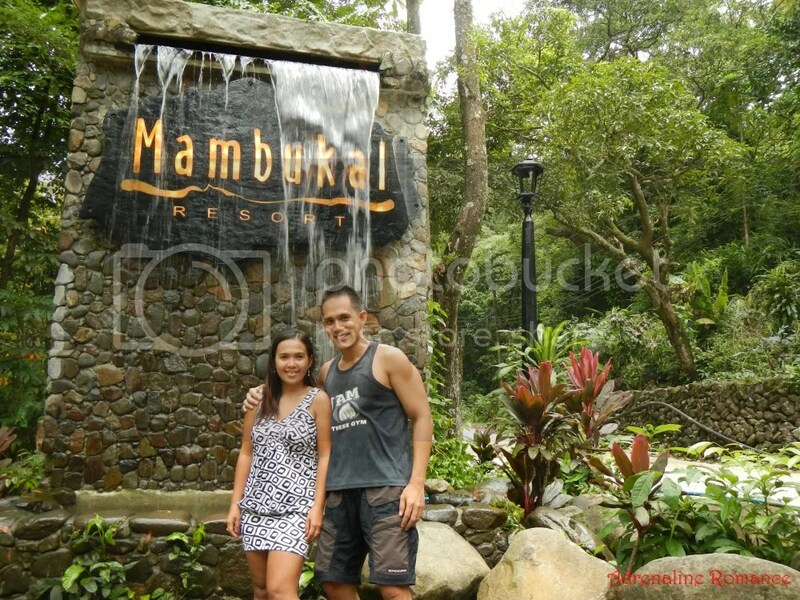 From Cebu, Mambukal Resort in Murcia can be reached via land trip. 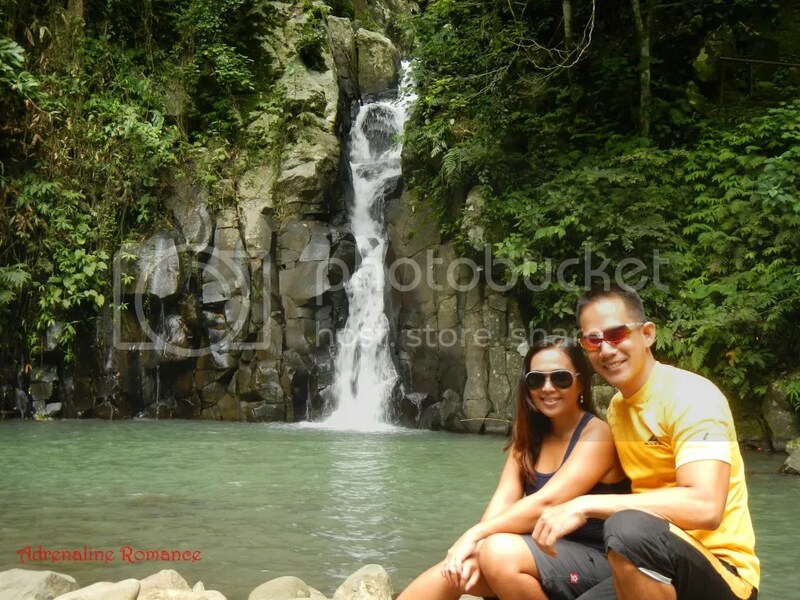 You can go all the way to Bacolod (either via Toledo or Tabuelan) and ride a jeep to Mambukal, Murcia. However, the conductor of our bus advised us that we stop at the T-intersection between Murcia and Bacolod. From there, we rode a habal-habal to Murcia. This shaved of more than 30 minutes of our time. Thus, ride a Don Salvador-bound bus and tell the driver or conductor to drop you off at the Murcia/Mambukal intersection. 2. The buses bound for San Carlos City, Canlaon City, Don Salvador, and Bacolod are all stationed at the Cebu North Bus Terminal even though some of these buses travel south via Toledo. Negros-bound buses may also head north toward Tabuelan where they wait for a ferry to take them across the Tañon Strait. 3. Please find below the schedules of buses. Be careful and read every word on the board! The way the schedules are organized is quite tricky. After a swift glance at the schedule on the eve of our departure, Sweetie and I assumed that there was an 11 PM bus that was bound for Bacolod. It turned out we were dead wrong! 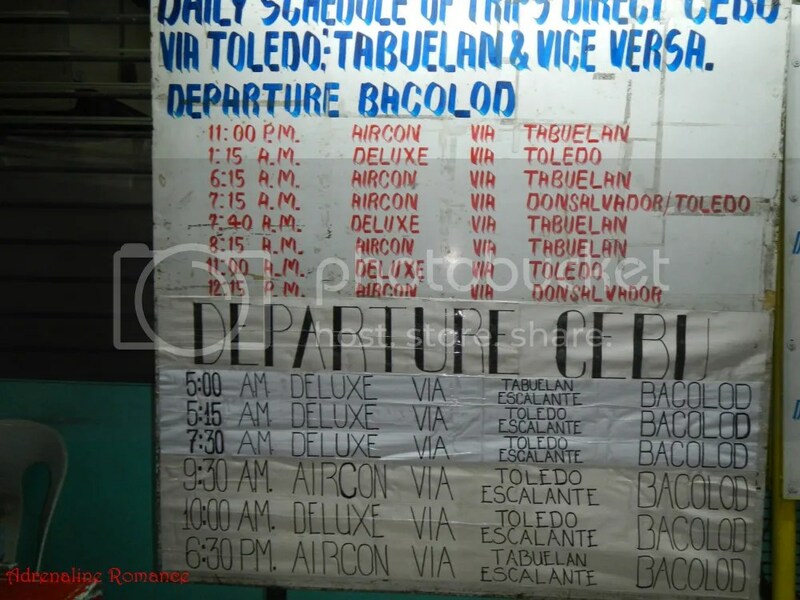 We failed to see the line that said “Departure Bacolod,” which means that the bus FROM Bacolod departs at 11 PM. We ended up sleeping uncomfortably in the terminal while waiting for the first trip to Bacolod out of Cebu, which is 4:30 AM. 4. Ride an air-conditioned bus; the rate is just P10 more expensive than the non-aircon one. Also, take the “with cot” rate on the ferry so you can rest while crossing the Tañon Strait. The “seat” rate is P190. 5. 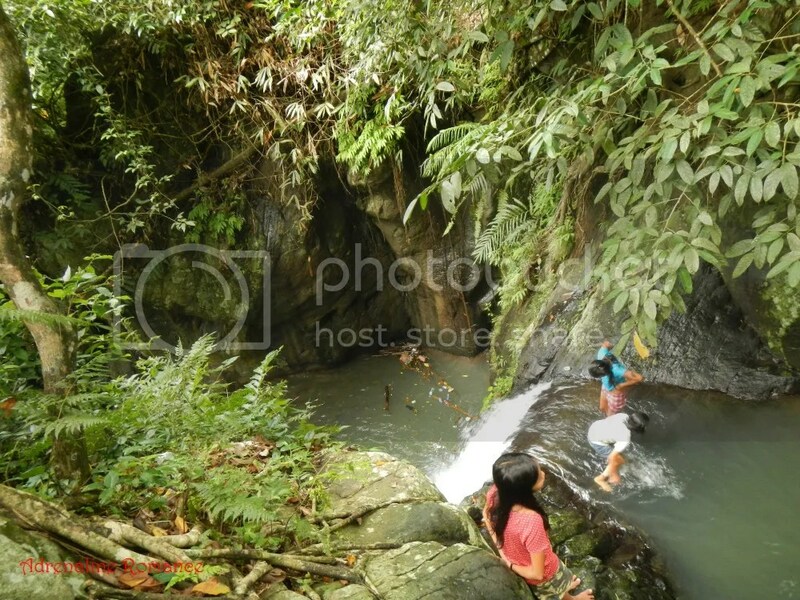 When exploring the waterfalls, you may encounter children who offer their services as guides. The trail is clearly marked and established up to the 6th waterfall, so you don’t need a guide for this. However, if you feel generous, then by all means, hire the guide. 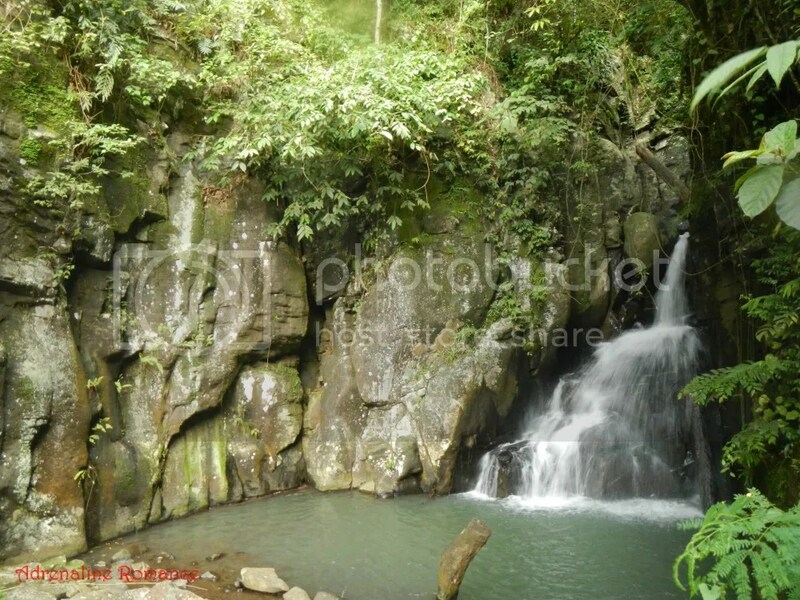 The 7th waterfall is located beyond the border of the resort and deep inside a mountain barangay. Roads and pathways cross, so you may either hire a guide or ask locals whom you meet along the way. 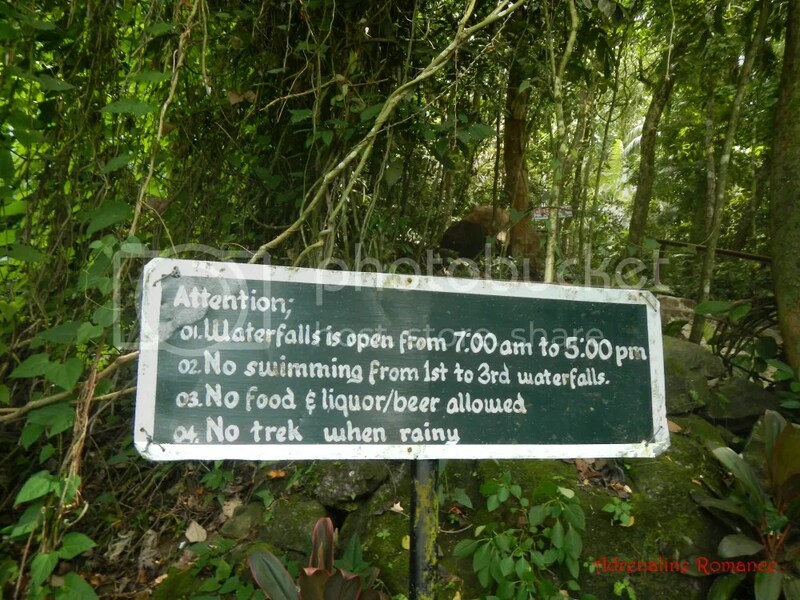 Note that many guests opt not to proceed to the 7th waterfall after learning they have to trek for half an hour after reaching Mambukal Resort’s border. 6. A relaxed hike to visit all seven waterfalls can be completed within an hour or so. Going back may take 45 minutes. 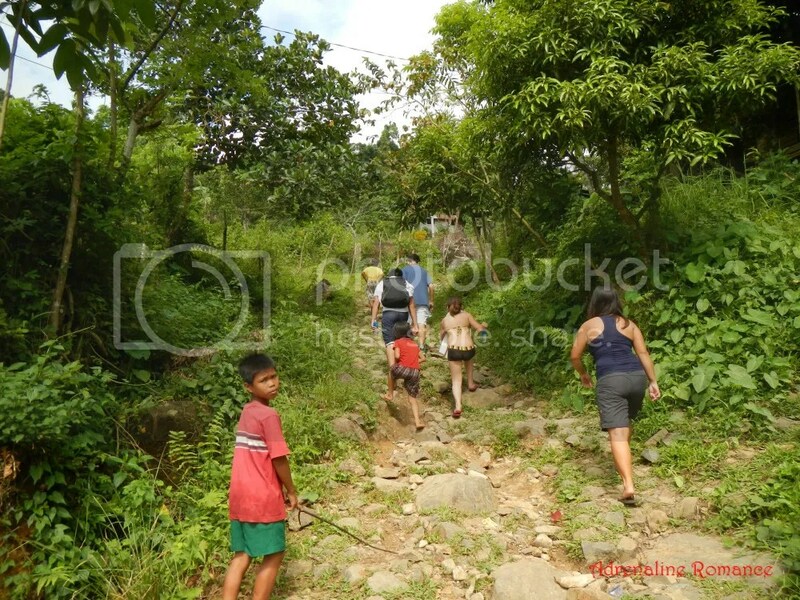 If you decide not to hike on your way back, you can simply flag down a habal-habal at the mountain barangay to take you down to Mambukal Resort. 7. Feeling hungry? Don’t worry. At the sixth fall, there’s a stall that sells snacks and drinks. 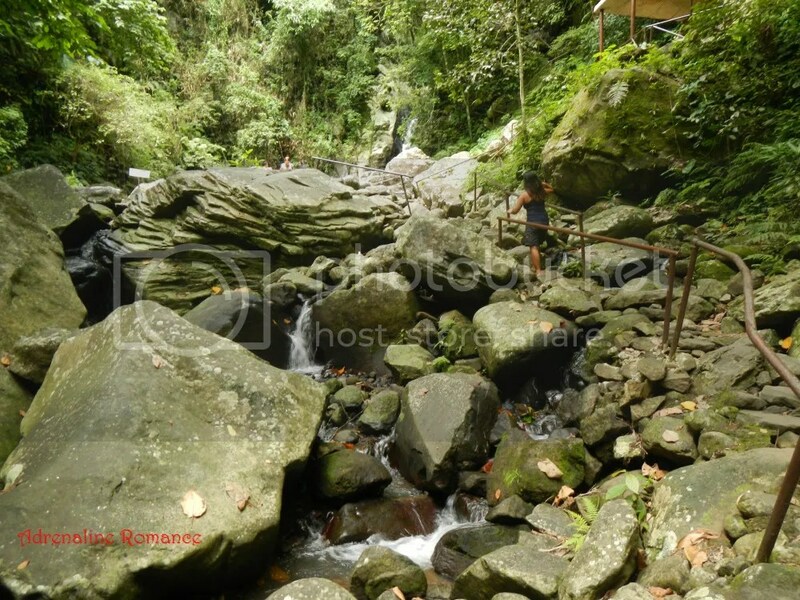 There are also several sari-sari stores as you reach the mountain barangay on your way to the 7th waterfall. 8. Don’t forget to waterproof your belongings. You can do this easily by wrapping your stuff with plastic bags or zip-lock sandwich bags before putting them inside your bag. Beautiful pictures, great information. Thanks for sharing your adventure with us. Now, is habal-habal a tricycle? Thank you for the compliment. A habal-habal is simply a motorcycle for hire. Just hop on behind the driver and off you go. A habal-habal driver may fill every inch of the vehicle. Thus, you may see habal-habals carrying up to 5 people! 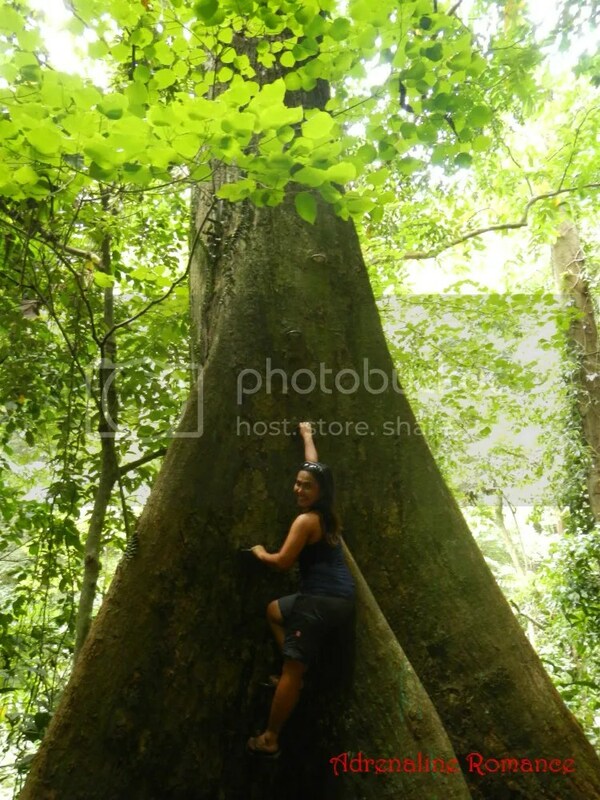 Hmmm….we should do an article about riding a habal-habal in the Philippines. Thanks for the explanation. Okay then. Based on your explanation, I’ve seen habal-habals then during our trip to Cebu (we went to Boljoon) year and a half ago. I just didn’t know what they’re called. That would be very interesting and fun if you write an article about them habal-habals. I don’t think I can ride in one of those if my life depended on it. I can walk a mile without a problem. Looking forward to your next adventure and yes, please, post pictures of them habal-habals. Hehe! Many people I know don’t ride habal-habals either. In many rural/mountain areas though, the habal-habal is the only way to get to places. We’ll definitely make a blog post regarding habal-habals and jeepneys someday. These vehicles are definitely part of adventuring in the Philippines. It’s best to hike up to the seven waterfalls earlier in the morning. 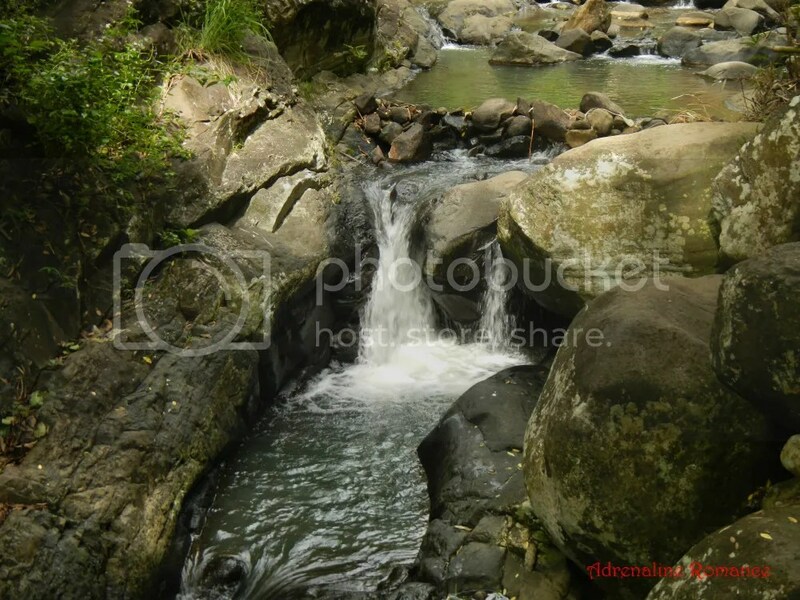 The weather is cool and the heat of the sun won’t tire you on your way to the 7th waterfall. When you start your trek by mid-afternoon, just like what we did, it will be sundown by the time you retrace your steps. I think there were no lights or lamp posts on the trail. Just don’t forget to bring flashlights or a headlamp if you still wish to take the trek by that time. And one thing, let’s be mindful of our trash. We’ve seen a few on the trail. On the 4th waterfall, which isn’t accessible, you could see a lot there. I hope the management would make it a priority to clean up whatever trash is there to preserve its beauty. Truly, it is nice in Mambukal..unfortunately, I didn’t had the time to walk with my friends to the Seven Waterfalls because of my knees. 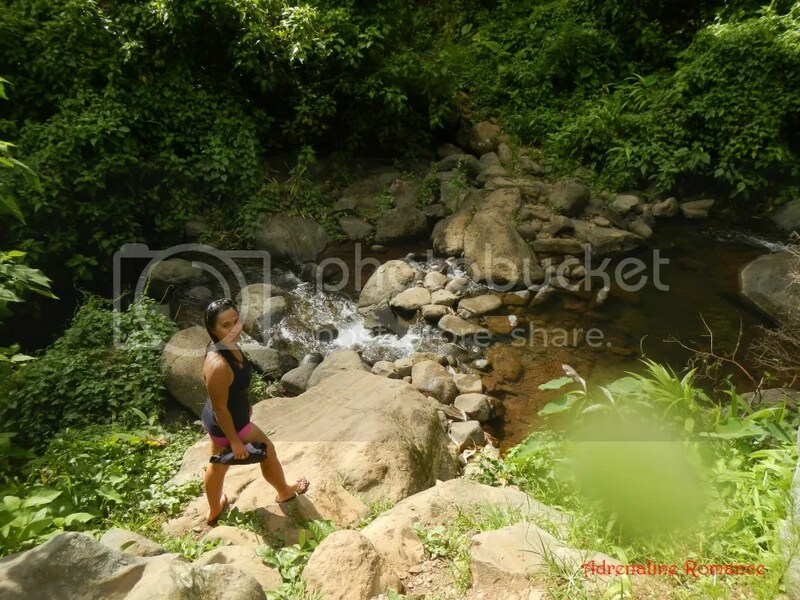 Anyways, I am so glad about your adventures that I get to see what my friends are talking about after their hike…But everytime me and my husband goes to Bacolod, I always go to Mambukal. I love it there! Actually, the entire trek from the 1st to the 7th waterfall only takes an hour or so. It’s an easy trek, actually. Of course, it would be best if you can get your physician’s advice especially if you have knee problems. Mambukal is a really great resort. We love their hot pool! Hehehe! Hopefully, next time, we will be able to try out their wall climbing facility. 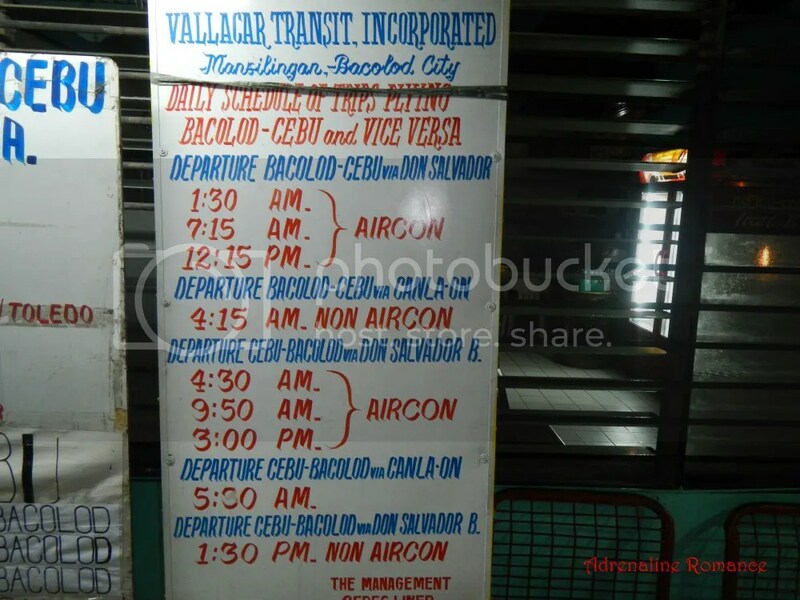 How long is the travel from San Carlos City to Mambukal? We didn’t time our road travel, but we estimate it to be around 2 hours. Do they have mobile no.? Hi, is the trek tolerable if ever I tag along my 2 year old kid? Sounds great ! Not one but seven waterfalls…can’t wait to get back to the P.I. and check them out. Thnaks for sharing.